Freakify.com is coming up with another exciting giveaway for all the promising designers. So the robust august offers three credit packs of 100 points worth $99 each by TheAdStock. Shortly, I will be telling you how you can avail this. TheAdStock is new addition in the sites of photography and is serving all the designers well. It is quite different from all other stock photography sites. It is quite a common observation that you see designers cropping their images to perfection in order to get rid of the backgrounds. They spend hours struggling with softwares like Photoshop to accomplish this, but now they need not too do this anymore. Here comes the savior “TheAdStock” which is offering transparent images which you can use for accomplishing tasks like ads, websites, blogs, flyers, brochures and other advertising materials, digital or printed. All you have to do is to drag the button and off goes your background. This remarkable site was created by Smartketer LLC previously makers of the BannerSnack already known for making best banners. This idea grew bigger and today we see TheAdStock progressing. What makes TheAdStock special is that most of the sites allow you to download only the JPGs only but this site sells only best quality TIFFs and PNGs. At the same time it allows you to have a preview of your image on different background colors. 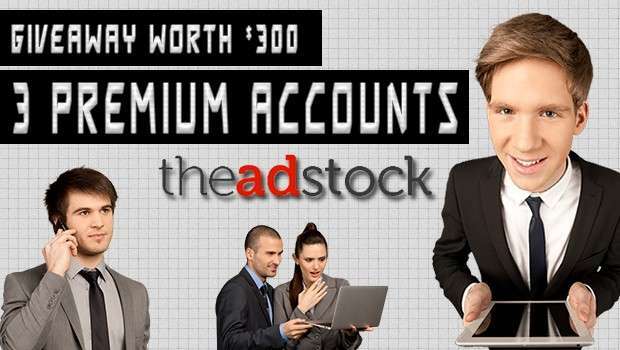 You will get 3 Premium Accounts with 100 points of credit each worth $99 of TheAdStock by which you can download ready-to-use stock images. So avail yourself from this exciting offer by entering the contest. This is the 5th Giveaway and by now you must be quite familiar with the procedure how you can win it. Still I am repeating it again, all you have to do is to just drop in your valuable comment and share this link/post on any of the social networking sites that you are on and register yourself as a contestant. To do all this use the widget below, once you complete it, come tomorrow to earn more points. We don’t giveaway stuff to those who visit only once and share only once. The Giveaway will end by this Monday i.e. 13th August, 2012. So hurry up and garb this exciting Giveaway. Winners will be announced right after the contest ends.